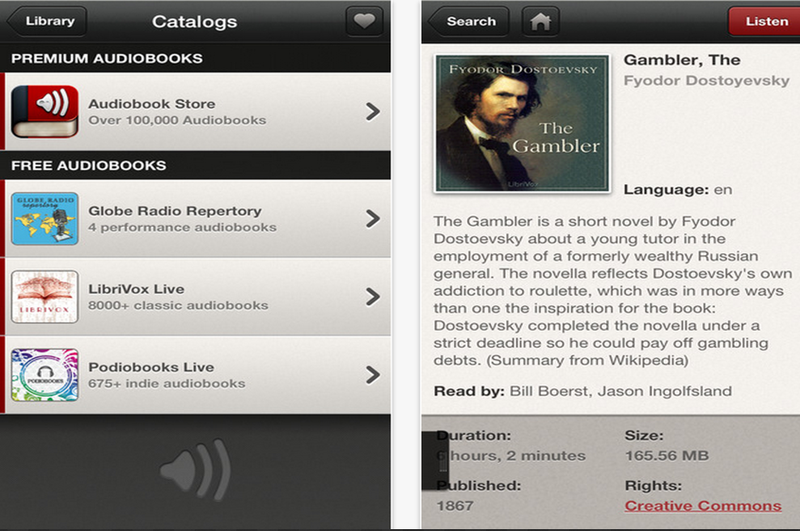 Audiobooks HQ is an iPad app that provides over 9000 free audiobooks. The app is free today and only for a limited period of time. Using Audiobooks HQ will enable you access to a huge library of interesting audiobooks covering a wide variety of topics from latest best sellers to timeless classics. It also features over 100,000 premium audiobooks. All the recordings in Audiobooks HQ are available in high quality. You simply turn on HQ downloads in settings and all your books will be downloaded in high quality. You can use the search functionality in Audiobooks HQ to easily navigate its catalog and find titles to download. To get better results refine your search query using criteria such as most downloaded, top rated, genre, tag, language , duration, or solo reader. Alternatively, you can use an integrated feature in the app called ‘Irksome Recommends’ to access a carefully curated selection of audiobooks. A huge selection of 9,750 free books to choose from--more than any other audiobook app! Controls to speed up or slow down the playback in 40 increments without altering the pitch. Easy search functions to discover the best books and readers. Find books by most downloaded, top rated, genres, tags, solo read books,and Inkstone’s top recommendations. 4 audiobook catalogs to choose from including LibriVox, Podiobooks, Globe Radio Repertory, and Premium Audiobook Store.